We are giving you a second chance to catch one of our favorite sessions! 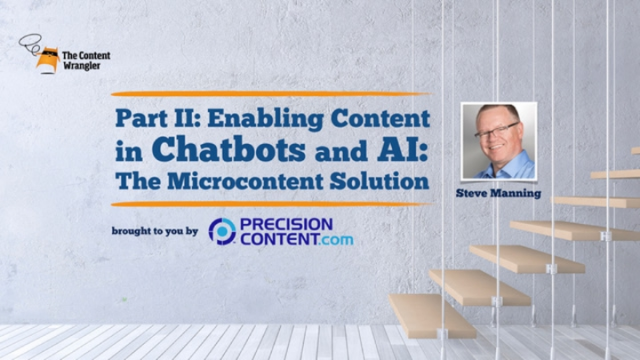 The addition of Bots, voice-enabled interfaces, and Artificial Intelligence means we must change the way we structure content. We are moving from a broadcast style of communication – publish and hope for the best – to a more conversational style of communication. More question and answer. This imposes requirements on the content models you need to create if you want to talk to the Bots. We must be more granular in our models. We need to implement Microcontent. Join our special guest host, Val Swisher, and Steve Manning In Part II of this series, where Steve will go a little deeper. He will discuss the language of bots/AI: intents, attributes, and assets. Then he’ll relate that to how the granularity you design into your models, the semantic labels you apply to elements, and the taxonomy you capture in creation can make or break your ability to publish DITA content to the new technologies. The session will include real-world scenarios that rely on a microcontent strategy.